No two museums respond alike to the restitution claims made by the descendants of Jewish art collectors expropriated by the Nazis. swissinfo.ch looks at three cases in Switzerland with very different resolutions. Albert von Keller, Madame La Suire, was proven to be owned by the heirs of the original German owners, who decided to leave it in the collection of Kunsthaus Zurich. In a case where a painting resurfaced and was identified only after it was exposed as part of a collection donated to the museum, Kunsthaus Zurich responded favourably and quickly to a restitution claim made in the name of the surviving descendants. “Madame La Suire” by Swiss painter Albert von Keller belonged to a Jewish art collector, Alfred Sommerguth whose belongings, including 106 paintings, were seized and auctioned off by the Nazi government before he fled to the United States. 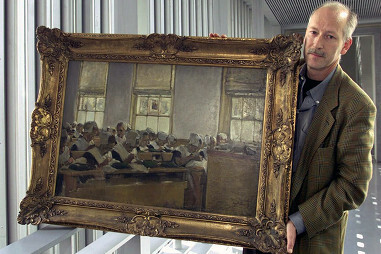 The Kunsthaus recognised the ownership claim and proposed to purchase the painting from the heirs, after they declined to take it back. The family chose instead to donate it, on the condition that the following information be displayed alongside: “Stolen from Alfred Sommerguth in 1939 by the Nazis. Gift of his heirs and of Mrs. Hannelore Müller in 2010.” The provenance of two other paintings in the same collection are still being examined. 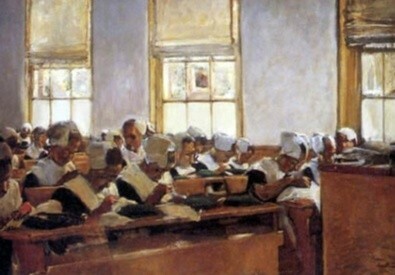 Max Lieberman, Nähschule – Arbeitssaal im Amsterdamer Waisenhaus (Sewing School – The Workroom of the Amsterdam orphanage) was unconditionally restituted to the heir of a Jewish art collector by the Chur Art Museum. Moral grounds The case of a painting by Max Lieberman was more problematic, because it had not been confiscated, but willingly sold by the Jewish art collector, Max Silberberg, as early as 1934. It was established however that the sale took place under duress, so the Chur Art museum, which had received the painting as a donation in 1992 decided in 2000 to return it to Silberberg’s heir. The museum issued a statement that it had acted on moral grounds in compliance with the Washington Principles. La Chaux-de-Fonds Fine arts museum rejected a restitution claim on the grounds that the painting is part of an inalienable collection and was acquired in good faith. A decision that made world headlines was the refusal in 2009 by the Fine Arts Museum in La Chaux-de-Fonds in the Swiss Jura to return a painting by John Constable (pictured above) taken from the Jaffé family during WW2. “We are being spoliated a second time,” Alain Monteagle, one of the rightful heirs to the dispersed Jaffé art collection told me. John and Anna Jaffé were British nationals of German Jewish extraction who lived on the French Riviera. Their valuable collection of over 60 paintings was seized by the pro-Nazi Vichy government in 1942 upon the death of Anna, who was widowed and childless, but who had bequeathed the Jaffé possessions to her niece and nephews, one of whom was Monteagle’s grandfather. 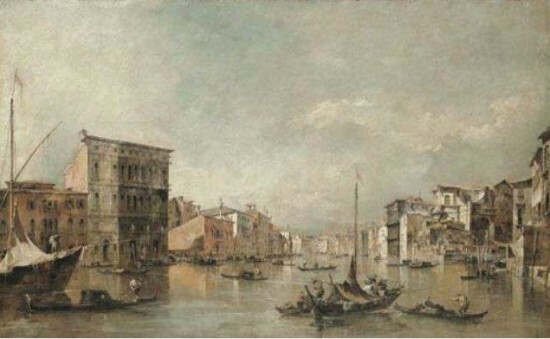 Francesco Guardi, The Grand Canal with the Bembo Palace, was part of the Jaffé estate auctioned off in 1942. The entire collection was auctioned off as Jewish property for a fraction of its value, including a Guardi view of the Venice Grand Canal (now at the Getty Museum in Los Angeles) that was put aside for Hitler’s own projected museum in Linz, Austria. The Flemish masterpieces of the collection were appropriated by Hermann Goering, Hitler’s right-hand man and founder of the Gestapo. “The Nazis didn’t appreciate the British School of painting. Gainsborough and Turner were too sober for their tastes (FR: manquait de clinquant),” Monteagle said, adding that the auction catalogue presented the works as copies “in the manner of”. The Jaffé family’s long-standing crusade to locate and retrieve the art collection has been well received in France, including with the Louvre museum that has responded to claims, in the Netherlands and in the US, but not in Switzerland. To justify its refusal to give back the Constable, La Chaux-de-Fonds applied a disposition of Swiss law that protects a buyer who has acted in good faith, regardless of the provenance of the goods, including stolen goods. In other countries, for example Germany, the US and France, looted art remains looted art, no matter the good faith of the last buyer. “Claims are to be treated according to local legislation in abeyance of the Washington Principles,” Jean-Pierre Veya, the La Chaux-de-Fonds city counsellor in charge of the claim said in response to a request for clarification. Switzerland does not have any specific legislation to deal with looted art, he said, which is treated like any other property. On the other hand, the period during which a claim on cultural goods can still be made was extended to 30 years in 2003, up from five. Veya explained that the Constable painting was part of an inalienable collection that was bequeathed to La Chaux-de-Fonds in 1986 on the condition that it remain in perpetuity with the museum and accessible to the public. The Junod Collection, comprising of 30 world-class paintings, is the centrepiece of the small, but delightful, museum.The Constable painting was purchased by the Junods in 1946 when, as Monteagle, pointed out, there were many bargains to be made. “Although it is our duty to recognize the hardship endured by the Jews during the Nazi era, it is also our obligation to stay within the boundaries of the law,” Veya insisted. If the intention of the Jaffé heirs is to sell the Constable anyway, he does not understand why they do not address an indemnity claim to the French government. “If you know who the robber is, he is the one to go after,” he suggested. Provenance research in art, Veya points out, is not like finding out who owned a building that doesn’t move. Records of transactions have disappeared (see accompanying article). In France alone, 2,000 works looted by the Nazis and returned by the Allies in 1946 are still labeled M.N.R. for Musée Nationaux Récupération, because the rightful owners have not been identified. Four of those were Jaffé possessions that Monteagle was able to claim. William Turner, Glaucus and Scylla (1841) was returned to the Jaffé heirs in 2007 and bought back by the Kimbell Art Museum the same year. 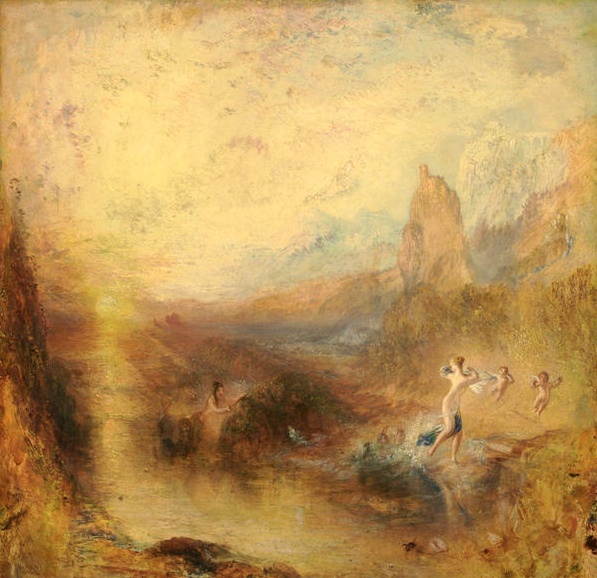 In contrast to the attitude of the Swiss museum, Monteagle mentioned the exemplary behaviour of the Kimbell Art Museum in Texas that decided in 2006 to give back one of its prize possessions, William Turner’s Glaucus and Scylla (1841). “They told me that the claim could have dragged on for 25 years and ruined everyone if they had hired a team of lawyers to resist the well-documented request,” Monteagle revealed. The Turner was put up for auction by the successful claimants in 2007 and was repurchased by the Kimbell for $5.7 million. Monteagle recognizes that the phenomenal increase in art prices has generated what he considers to be unfair criticism when families sell the restituted art. In the case of the rightful Jaffé heirs, the search for the missing collection began 60 years ago and so far only 10 out of 60 paintings have been located. Furthermore, when purchased by prestigious institutions, the art becomes visible to a greater public, he pointed out. As a retired history teacher and active Green party member in France, Montagle says that his motivation is ethical. “If we don’t respect the Washington Principles and continue to allow museums to expose art looted by the Nazis, how can we expect emerging art markets, where plenty of money is available, to respect the regulations set up to prevent the trade of looted art”, he asked. “It is our duty to resist,” he said. Monteagle intends to create a foundation to assist potential claimants of Nazi-spoliated art.